"I am not aware of any such linkage, and neither are my colleagues in the negotiating team," said Ajay Mathur, one of India's top negotiators in Paris. "None of us recall any discussion in the negotiating team on any such linkage; I don't recall an offer of solar technology being discussed at all." 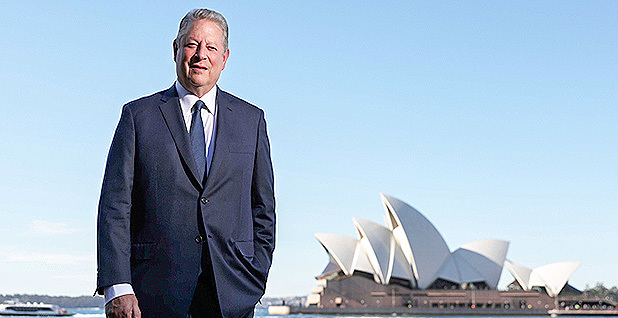 Film depicts Gore clinching 2015 deal. Did it happen? Viewers of the long-awaited sequel to “An Inconvenient Truth” walk away from the film with the impression that former Vice President Al Gore brokered a deal with India that saved the Paris climate accord in 2015. With talks outside the French capital in crisis and a deal in doubt, the film Paramount Pictures will release Friday shows Gore trying to solve what he calls “an India problem, first and foremost.” Various international climate notables had asked him to help the developing country see an economic upside in the Paris deal. The Trump administration has since withdrawn the United States from the deal. But the film takes viewers back to 2015, when the agreement was finally within grasp after decades of negotiations. The former vice president is shown twisting Lyndon Rive’s arm over the phone, asking the founder of San Mateo, Calif.-based SolarCity to grant India free use of a patented silicon-based bifacial photovoltaic cell if it would let the deal go forward. “Give it some thought, my friend,” Gore tells Rive, whose company has also employed Gore’s son. Rive did that. He gained his board’s approval and hopped a plane to Paris, where then-U.N. Secretary-General Ban Ki-moon’s special adviser, Robert Orr, said he presented it to Moon for his blessing and then to the Indians. SolarCity did not return calls for this story. What’s murkier is the contention that India accepted what “An Inconvenient Sequel: Truth to Power” presents as a quid pro quo: free solar intellectual property for domestic use in exchange for taking even modest steps away from its long-held positions. In Paris, India was digging in its heels on technology transfer, transparency and reporting requirements, the deal’s ambition to stop adding carbon to the atmosphere this century, and “climate justice” for developing countries. But numerous knowledgeable sources said India never gave Gore and Kerry an answer. As an interested party who was not part of the U.S. delegation, Gore was not in the negotiating room for U.S.-India bilateral talks in Paris. Those meetings were dominated by discussions about finance, compliance requirements and other issues. And almost 20 months after the gavel came down in Paris, there’s still scant evidence that SolarCity has delivered anything. “SolarCity has not come to India, and nor has it signed any agreement at all, and certainly no technology transfer agreement has been entered into between SolarCity and any Indian organization,” said Mathur. The company has never issued a press release taking credit for what Gore’s film offers as a game-changer and didn’t respond to calls for this story. An exclusive on the proposed deal was given to The New York Times but never ran. McManus said SolarCity “formally invited” Indian officials to visit its headquarters the year following the Paris deal. But that stops short of a formal delivery of intellectual property valuable enough to have helped move the needle in the negotiations.